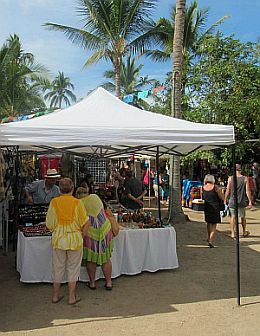 Scheduled to be held every Saturday from 9 am until 2 pm throughout the season, Tianguis Lo De Marcos expects to continue its history of drawing visitors from around Banderas Bay to the Riviera Nayarit. Lo de Marcos, Nayarit, Mexico - On Saturday, November 3, 2018, the Tianguis Lo de Marcos will reopen its doors for its fifth season, and it promises to offer Vallarta-Nayarit locals and visitors another year of shopping pleasures and loads of treasures! Set to be held every Saturday from 9:00 am until 2:00 pm in Lo De Marcos, a beautiful little coastal town on the Riviera Nayarit, just north of Puerto Vallarta, the Tianguis is set in a lovely courtyard that offers a comfortable outdoor shopping and socializing experience with great food, live music and many unique vendors. Stroll the grounds and browse through the vendor booths selling everything from homemade baked goods, garden fresh produce, freshly baked delicacies, salsas and spices, to hand blown glass, clothing, unique artisan items, jewelry and more, all in one place. The Tianguis is much more than shopping; it is a total community experience. Friends gather in the food court and catch up in the aisles. Each week brings new visitors and new vendors so there is always someone or something new to see! Season #5 will include some new additions, along with live music each week. The talented Alejando Chavez will "get the party started" on opening day, playing from 11:00 am to 1:00 pm for your enjoyment. "This Season will see the addition of a Holistic Healing Section," said Armando Contreras of Galvan Real Estate and Services, the event's organizer. "It will be located in a more quiet section of the Tianguis, so shoppers can talk to the vendors about the benefits of their individual product or service," he explained. 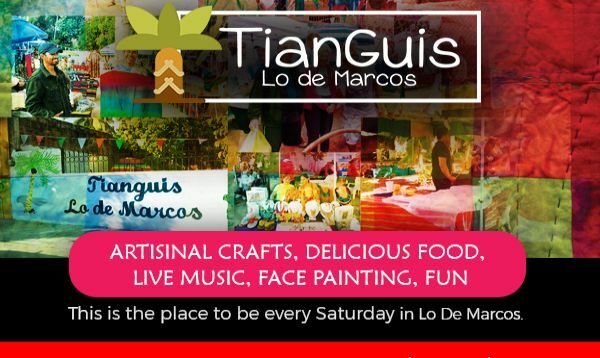 "The Tianguis brings great energy to the town of Lo De Marcos and is a great way to support our residents, visitors, farmers and craftspeople. Everyone is invited to stop in, enjoy this unique local Market, and have a great time," Contreras added. Held each Saturday from 9:00 am to 2:00 pm at Luis Echeverria #9 in the charming Pueblo of Lo de Marcos, this event is not to be missed! Applications are currently being accepted for the 2018/2019 Tianguis Season in Lo De Marcos. If you would like to be considered as a Vendor, please send an email to GalvanRealEstate4(at)gmail.com. For more information please call the Tianguis Lo de Marcos office at (327) 275-0233. To learn more about the Lo De Marcos Tianguis and some of the products that will be available come November, visit Lo de Marcos Tianguis on Facebook.